It seems like you've always had a thing for dinosaurs (and triceratops specifically). I'm more of a therapod person. I always wondered why the triceratons never made it into the original TMNT cartoon. Oh, but they did, Daniel-san. Hmm, I stand corrected. 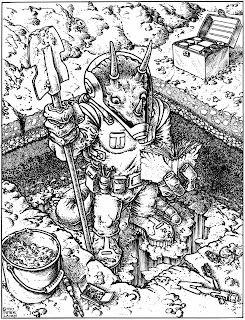 Thanks, S.
I think I remember reading that Triceratons predated the TMNT, but I guess this is proof positive. This guys looks a little more benign than the Tricertons of the federation, though. I love these old sketches you put here, I keep forgetting that the TMNT universe had a history before the first issue.